First things first. I changed my time settings to Central European Summer Time while I am here. That meant that the time posts for my previous entries are messed up, shifted six hours ahead. But that also meant that when I finish writing a post, it would be published immediately, and not six hours later. I was just annoyed with it and couldn't deal with it anymore. Ok, on to the real entry for the day. I find it rather bizarre to not be reading a book. The last time I was reading something was on my way here, I was reading a Stephen King novel. And when I finished it, I simply left it on my hotel in Helsingør. Anyway, I got myself a new book today, but I will explain about that later. Today was my second day in Copenhagen. They say that Copenhagen is an expensive city, but there are ways to circumvent that. Case in point: yesterday I visited the Ny Carlsberg Glyptotek for free, since it was a Sunday. And today, I made an itinerary that didn't involve an entrance fee at all. So, I woke up, had breakfast in the hotel, and headed out around 9:30 AM. I woke up earlier than that but most of the attractions of the city open up at 10:00 AM, so there was no point in going out earlier. Anyway, today, I headed northeast from my hotel, with the Little Mermaid statue as my destination. First, I reached Statsholmen, which is the seat of government of Denmark. The main feature of this is Christiansborg Slot, which houses the Parliament. This is the building. It has some ruins underneath it, which I wanted to visit today, but I arrived about fifteen minutes before it opened, so I got distracted and went somewhere else. I continued walking northeast instead. So I bumped into the stock exchange building, the Børsen, which is seen below. After that, I found myself inside Holmens Kirke, which is the church where Queen Margrethe II took her marriage vows. It was a beautiful church, full of intricate carvings inside. Take a look at this detail of the side pulpit. After that, I walked further and found myself crossing the canal at Nyhavn, the district where you can find colorful houses lined next to each other. I will be here later on for lunch, but in the meantime, I went further and walked next to the waterfront, until I found the statue. Here she is. Then, I went back southwest, and entered the Marmorkirken, which is a huge marble church imposing against the Amalienborg Palace. After taking pictures inside the church, I went back to the palace courtyard to watch the changing of the guards. Here is one of the shots I took. I wonder how heavy that head-thingy is. Afterwards, I went back to Nyhavn, and found this Lonely Planet-recommended restaurant, which offered a herring buffet. There were ten different dishes featuring herring, and I tried each one of them. Some were sweet, some were salty, some were just right. I downed them with dark Carlsberg beer. Of course, after all, I am in Denmark, why wouldn't I try Danish beer? After lunch, I slowed down, and went to the Botanisk Have, which is another green area in the city. The thing I notice with Copenhagen is that there are plenty of greenery around. And people like spending time in them. After taking some photos, I found a Danish bookstore with English books. 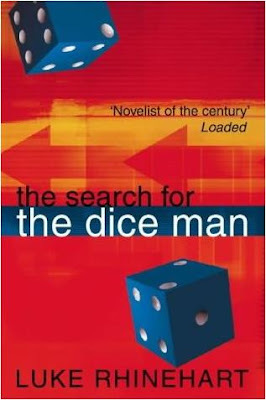 Since I wasn't reading anything, I bought a book entitled The Search for the Dice Man by Luke Rhinehart. It looks exciting, so I will let you know how that would turn out. After all, I have a four-hour connection in Brussels this Wednesday, and I need company. Oh, so you do have some pictures! Sorry, I read the last post first. Copenhagen looks great... seems like a wonderful city to walk on. I love the story of The Little Mermaid (one of my favorite fairy tales) and would love to see that statue someday. I know, the hats look really bulky. If ever there was an attack on the palace, I am sure the hat would just hinder the defense. Indeed Copenhagen is a walkable city. All the stuff you must see are close to each other, very compact.